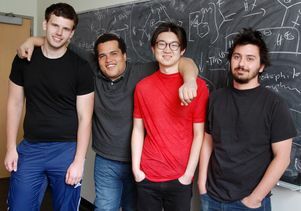 A new technique created by Brian Shao, Alex Bagdasarian, Stasik Popov and Hosea Nelson (from left) allows complex molecules to be assembled in fewer steps than previously possible. A basic step toward creating new molecules is selectively breaking and re-forming the chemical bonds that connect the atoms that make them up. One of the chief challenges is that the bond between carbon and hydrogen atoms — the building blocks of many molecules — is exceptionally strong, so chemists often have to resort to using rare and expensive chemicals like iridium to convert it into other, more useful types of chemical bonds. Scientists refer to this process as “functionalizing” the bonds. 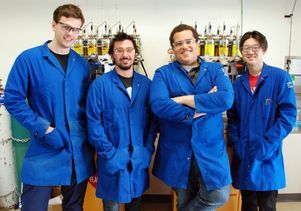 Now, a team of UCLA chemists has developed a new technique for breaking carbon–hydrogen bonds and making carbon–carbon bonds. 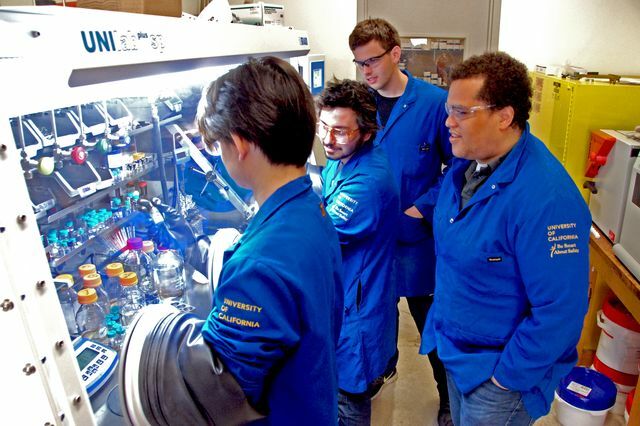 The approach uses catalysts made of two abundant and inexpensive elements, silicon and boron. Their research was published in Science. 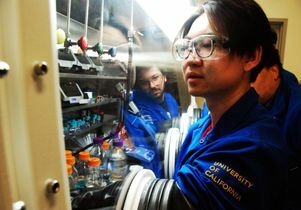 “This new method will enable scientists to incorporate methane into bigger molecules,” he said. Another potential application would be converting methane, one of the primary components of natural gas, into something that’s denser and easier to contain after it has been drilled from the Earth. The current process is complicated because methane, a light gas, tends to escape into the atmosphere. 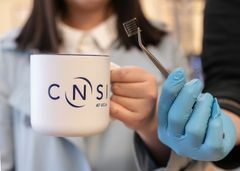 The researchers used their new technique to create a compound similar to a phenyl cation, a chemical substance that has been studied theoretically but rarely investigated in actual laboratory experiments. 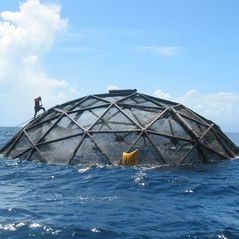 They then used the compound to slice through carbon–hydrogen bonds in methane and benzene, which allowed them to insert other atoms and form carbon–carbon bonds, which are the basic building blocks of molecules that make up living organisms, as well as fuels and pharmaceuticals. 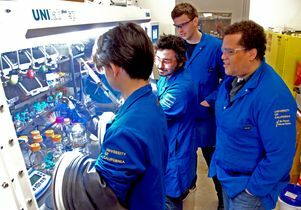 Besides demonstrating that phenyl cation–like compounds exist, the new technique allows complex molecules to be assembled in far fewer reaction steps than was previously possible, which could save chemical and pharmaceutical manufacturers time and money. Another advantage of the method is that, unlike previous approaches, it can be performed at temperatures and gas pressures that are easily attainable in a laboratory. The chemists have tested their technique using very small samples of reactants — far less than a gram. 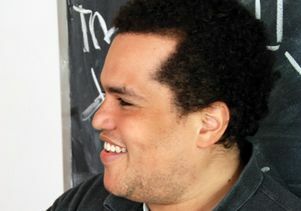 But Nelson is hopeful that the methodology can be scaled up to be useful for a broad range of real-world chemical reactions. From left: Stasik Popov, Hosea Nelson, Brian Shao and Alex Bagdasarian in Nelson’s office.